Robots, coupons, and oat-based cupcakes for dogs—what’s not to like? 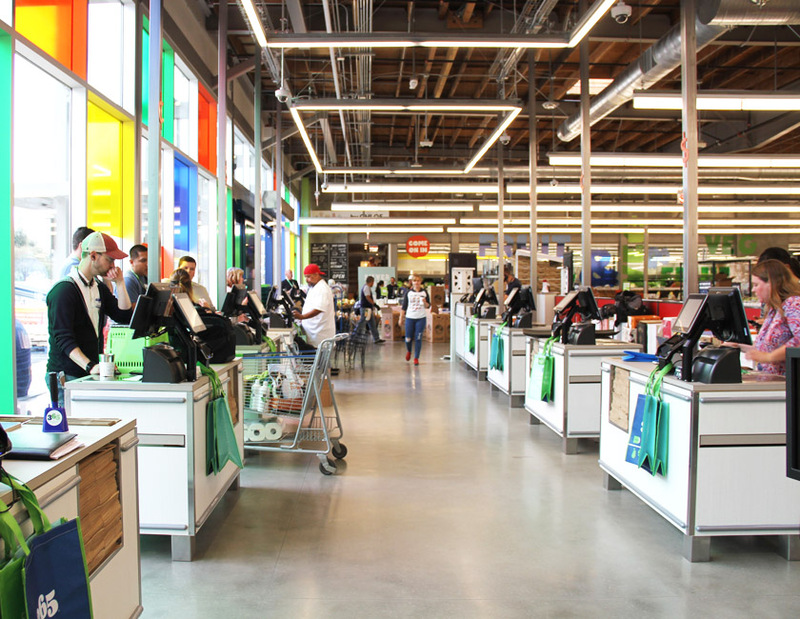 Yesterday at 9 a.m. the most important thing to happen in Silver Lake since Moby started a vegan restaurant happened: the Whole Foods finally opened. 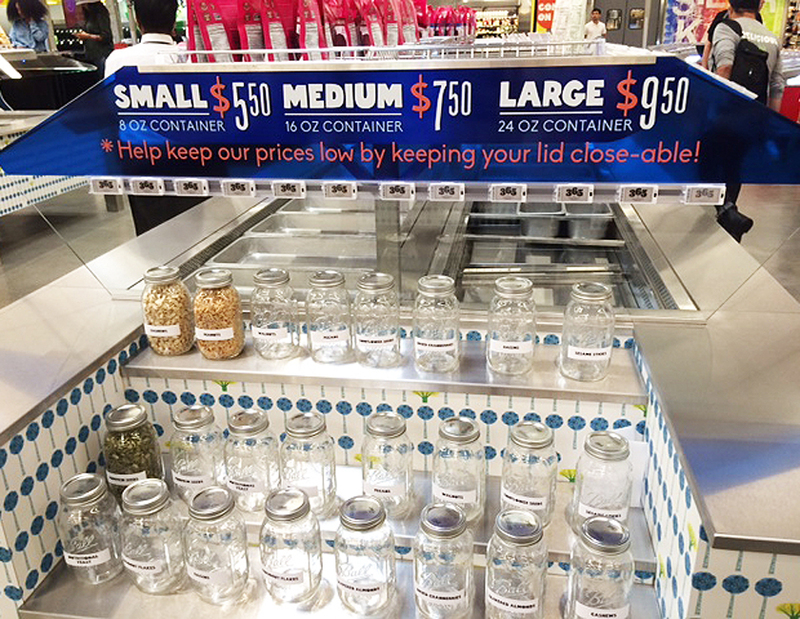 Not just any Whole Foods, but 365 by Whole Foods Market, a brand new concept aimed at offering a more affordable range of products to consumers. That is true, technically. But, as we’ve addressed before, it’s more affordable only by virtue of its not stocking any high priced items, and focusing on its already cheaper 365 brand products. It’s as if McDonald’s opened a so-called healthier restaurant, but all they served was apple slices, milk, and those grilled chicken wraps. 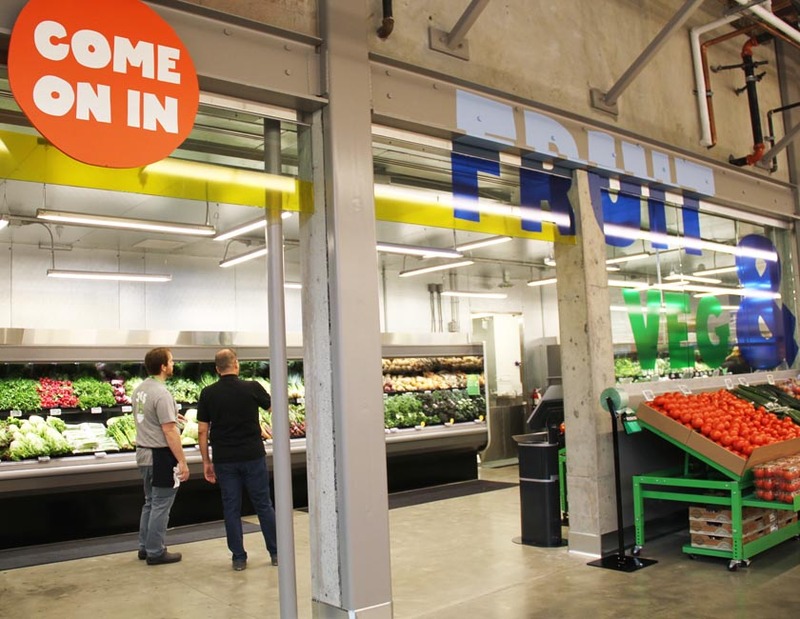 But hey, it’s still Whole Foods in a neighborhood that sorely needed another grocery option—and we surely appreciate many of the things we saw during a sneak preview earlier this week. Does one need a fancy machine to dispense loose-leaf tea into a cup and pour hot water over it? No. But we don’t need four different shows about Tiny Houses either, yet here we are. 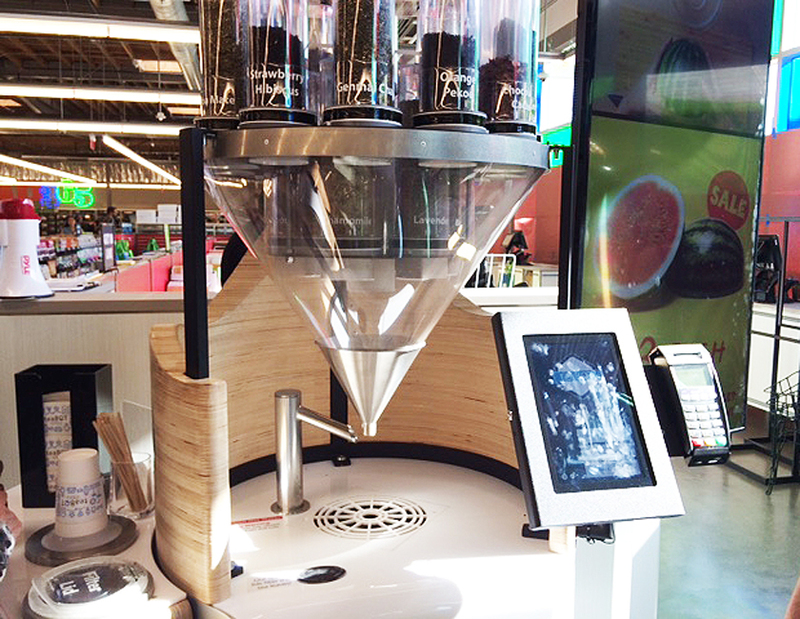 With the teaBOT, you select which teas you want at what proportions, the bot dumps it into a paper cup, pours hot water over it, and then a special lid strains out the tea as you drink (and by special, we mean it has a little strip of sponge over the drink hole.) We asked what brand of tea they’re using and got the answer “a large national brand,” which again calls the teaBOT’s overall necessity into question. But we also let out a little squeal when the tea leaves went ‘kerplunk’ and the water went ‘sploosh!’ so we’re on the side of loving this thing. OK, this one isn’t actually called a wine bot—it’s an iPad strapped to a pedestal the height of a fourth grader—but it is a high-tech way to pick out hooch. 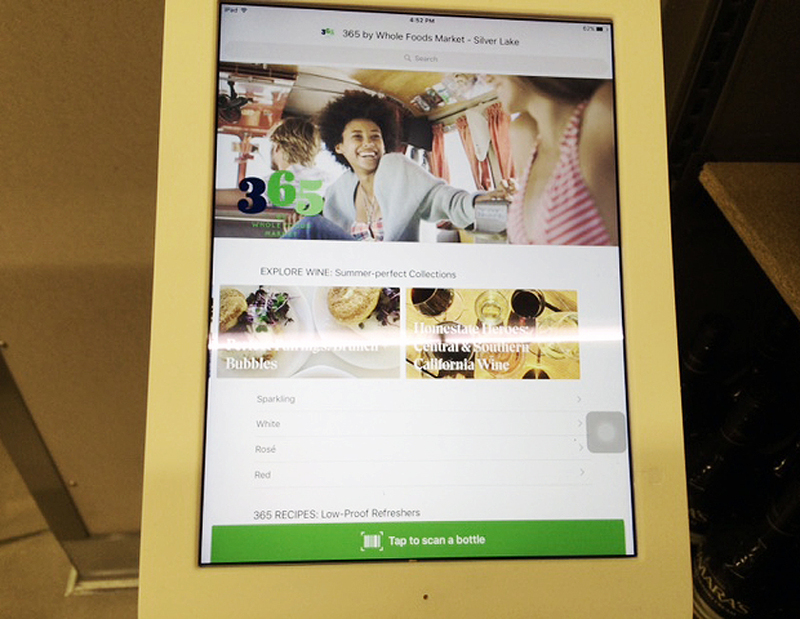 The popular wine app Delectable has teamed with 365 to feature a pair of these stations near the wine and spirits section. You can grab a bottle, scan the barcode, and the screen will display all sorts of information about the wine as well as reviews from pros and regular drinkers alike. You can also tell the app what you like and it’ll recommend bottles from the store’s selection. Groovy. Of course, the Delectable stations are just another way to avoid hiring more staffers who really know their stuff. But honestly we don’t need a paid expert to tell us that we want to chug bulk rosé. Any salad bar pro knows that cucumbers are a no-no. The 365 model, however, breaks the chains of weight limitations, opting for a pricing model that hinges on container size—small, medium, or large—not heft. The same goes for hot prepared foods and bulk grains, etc. We still may pass over those slimy cukes, but it’s not because we can’t afford ’em. Yes, folks, it seems that sustainably raised, acorn-fed pigs can indeed fly: Whole Foods is offering deals. The store’s My 365 Rewards Program offers a few perks, including “Gimme 10 Deals” which offers featured items at a 10 percent discount for members. Two bonuses here: All of these items will be conveniently grouped together at the ends of aisles (or “aisle caps” as they’re known in the industry.) Also, the Rewards Program is purely digital, which means there’s no bougie keychain or card to keep track of. Love those bagged salad greens? (You know I do). 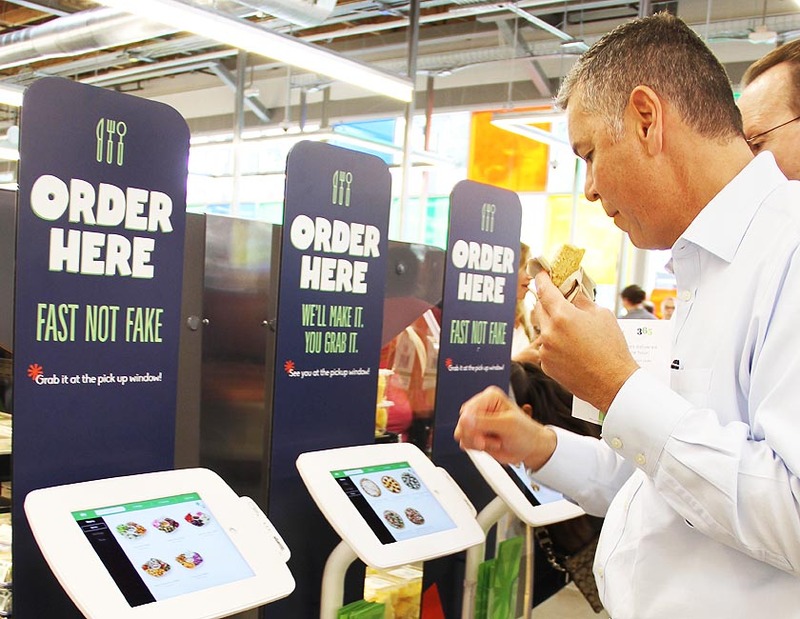 Another prong of the 365 Rewards Program is the digital punch card, a sort of loyalty program for select produce items that rewards shoppers with a free item after their ninth purchase. For instance, if you buy packs of Organic Girl mixed greens nine times, your tenth would be free. Same goes for Driscoll’s blueberries. Since 80 percent of my grocery list never varies, this is one place where 365 might actually offer some real price benefits. No longer must we shout our embarrasingly customized orders over the heads of other customers, or be tempted by the pizza station while we mull around waiting for our tofu and greens bowl. All of the on-the-spot prepared foods are ordered though even more iPad kiosks, and picked up later from a window near the back. 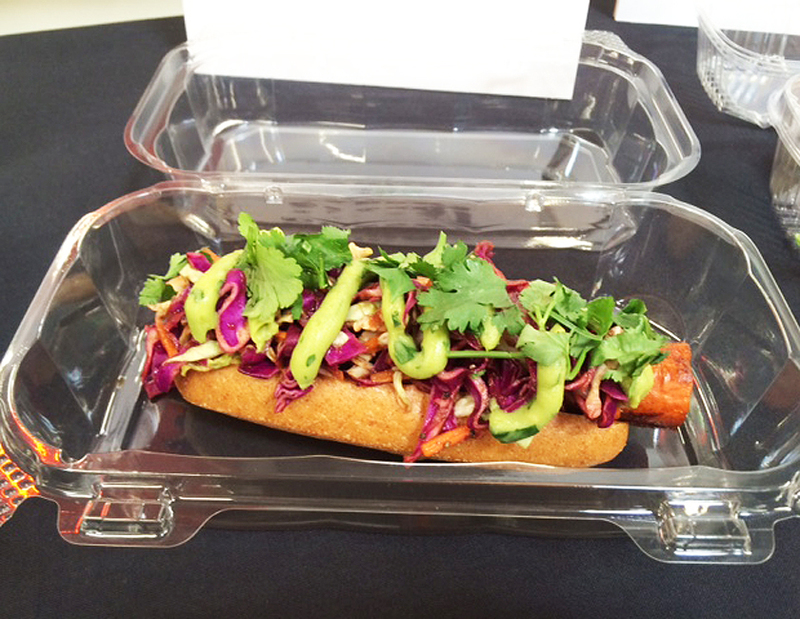 The prepared foods area has added some never-before-seen dishes, including one straight out of the playbook of chef Neal Fraser’s Fritzi Dog: the carrot dog. Yes, it’s a soft-cooked carrot with some slaw and spicy stuff, and it tastes about as much like a hot dog as it does a plate of prime rib. However, should you have a hankering for something tube-shaped in a bun, this’ll do. But if you’ve talked to anyone from New York over the past year—vegan or not—they’ve probably gushed over vegan food’s current ‘it’ girl Chloe Coscarelli. The first L.A. outpost of her New York restaurant by. CHLOE will be attached to the store, and they’re offering nut, grain, and bean-based burgers, fancy brunch fare, air-baked fries, juices, etc. Plus, if there’s one thing vegans care about more than their own bodies, it’s their animals. So it just makes sense that Chloe would craft whole-oat K9 cupcakes for the pups, too. Have you ever tried to take a shopping cart through the aisles of a Trader Joe’s? It’s like trying to squeeze into a pair of Lululemons after eating four vegan dog cupcakes (see above). These aisles at 365 just feel big and spacious and uncluttered. Perhaps that’s from all the fancy high-end items they’re not carrying? Which brings us to one caveat we’d like to make about this new market: there’s something condescending about conflating the ideas of value and reduced access to higher quality items. It’s as if we can’t be trusted around bottles of $36 olive oil or premium, freshly cut rib eye steaks. The kindergarten-esque color scheme, too, seems to only enforce the feeling that we’re being treated like children. 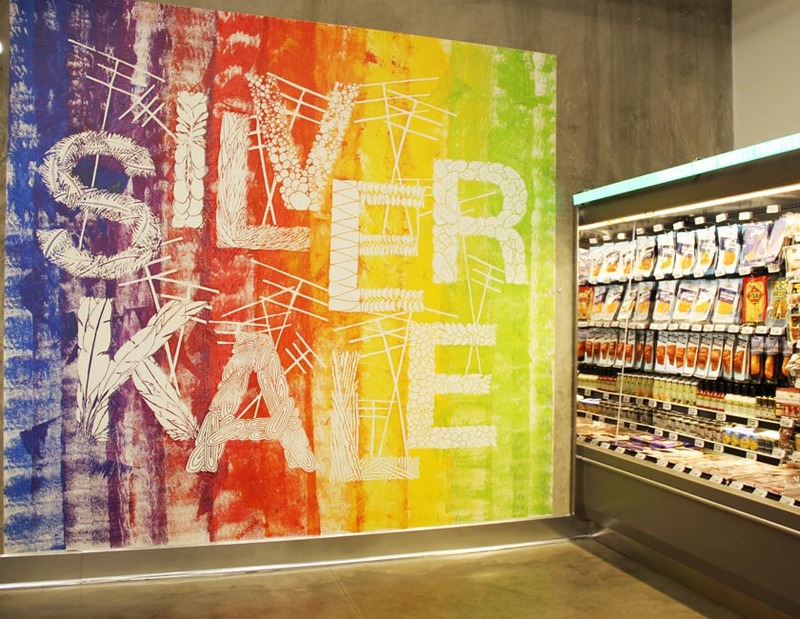 (Don’t get us started on that Silver Lake/Silver Kale anagram mural, which seems like something scraped up from the Portlandia cutting room floor.) Limiting our choices isn’t the same as saving us money. Stop pretending it is. 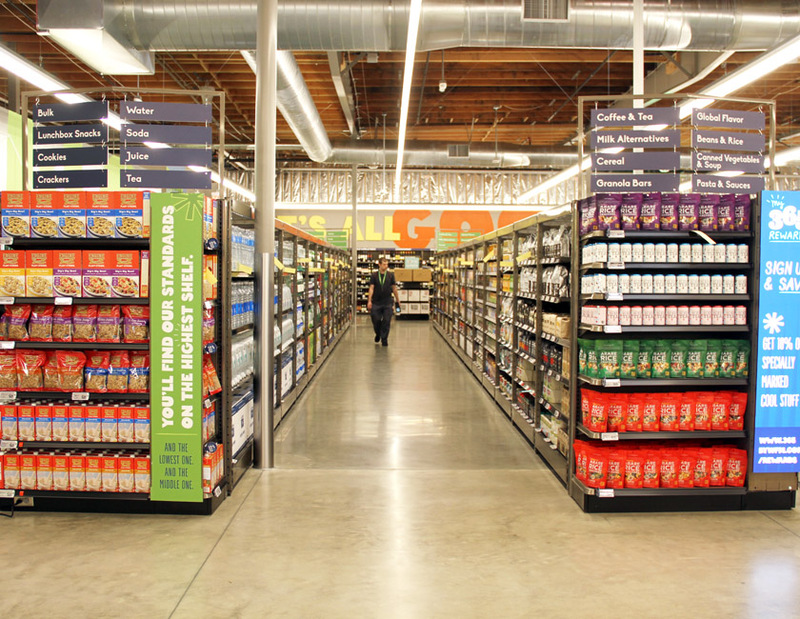 Still, as a northeast L.A. resident with a penchant for pre-packaged non-GMO chicken thighs and futuristic beverage dispensers, this will likely become one of my regular grocery stores, and I’m happy it’s here. Which is to say, see you at the tea.Bot, folks. Next articleWhere Could L.A. Use a Giant Straddling Bus?